First to let you know I found this book to be truly breath-taking. I so immensely enjoyed reading this book that I was thinking of the story long after I read it. The story-line was brilliant, fun, and ever so much a hunting tale to leaves you wanting more. Author, Tara Hudson wrote such a impeccable story with so much charm and pose in her writing style. 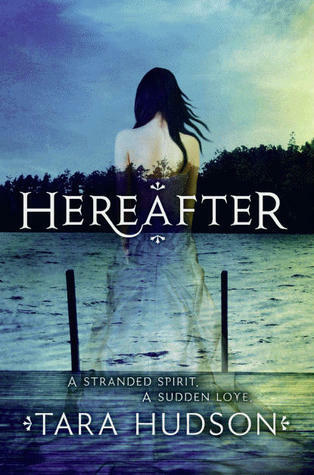 I was blown away by how intriguing Hereafter was, and loved the character's. I love when I can fall in love with a character in a book simply by how the author describes there actions, words, and traits. This was one of those books where if you put the book down your always wondering what will happen next. The whole aspect of this book was a fun, refreshing, and outstanding read. Everything about Hereafter was so prefect and I really enjoyed reading it. This is a story of a girl named, Amelia and not of her life but her death. Only after waking up from a horrible drowning she knows she is no longer alive but dead and keeps having to relive her death only to wake up in the graveyard were her body is now buried. Two things Amelia now knows are true, is one she does not know why she died, and two Joshua is able to see her. After seeing him by the river as he drove his car into it by accident and watching his almost drown she comes to find out that he is able to see her but why? Who said you can't have a friend in the afterlife?! Amelia and Joshua become more than friends as they begin to uncover the reason for Amelia's death, but someone else who is also not of the living begins to turn her away from what she is likely to find. Eli, a spirit has other plans for Amelia, more of the frighting nature. Amelia now has to face the truth about her dead and with who and where she should spend her afterlife with... good or evil? One thing she does know is Joshua loves her dead or alive, but will that be enough to stay with him even know he is among the living. Later Amelia struggles with Eli and his plan to drag her to the ghost world for a very hunting and horrifying new life. The ending of Hereafter will leave longing for more. I want to thank the author Tara for writing such a charming and outstanding book. Your book makes me happy to be reading. Hereafter would be one of my favorite books of 2011 and I would definitely recommend this book to a reader who wants to dive deeper into the paranormal YA genre. This sounds like a great read. I have it on mt TBR list for a while now. Great review.